What Can You Do with Plastic Eggs? Even at full price, plastic eggs are usually fairly inexpensive. But with seasonal sales, you can often find them at give-away prices. When you find a bargain price, be sure to stock up. You will find so many ways to use the eggs for learning activities! Here are a few ideas to get you started, but you are bound to think of many more! Word of Caution: Check the label of any plastic eggs you purchase to be sure they are approved for the ages of the children who will be using them. Immediately discard any broken eggs. Some of the activities suggest using small objects. Use these only with children who are old enough not to place them in their mouths. DRAMATIC PLAY: Plastic eggs are great props for pretending! Here are a few ways to try. Pretend Cooking: If you can find eggs in natural colors, those would be ideal. But the children will not mind cooking with colored eggs. They will enjoy pretending to crack them open and add them to soups, cakes, or whatever is on the menu. Eggs in Nests: Use the eggs with toy chickens or other birds. The children may enjoy making nests and placing the eggs in them. They can also pretend to gather eggs on a farm. Inspire Creativity: Children may also use the eggs in surprising ways! They may decide the plastic eggs are pirate treasure, giant seeds, or anything they need them to be. ACTIVE GAMES: These games are fun anytime! Egg on a Spoon: Walk from a starting point to a finish line balancing an egg on a large mixing spoon. Egg Roll: On hands and knees, children may push the eggs across the grass with their noses. They may also scoot the eggs using other body parts, clean flyswatters, or brooms. Egg Toss: The children may toss the eggs back and forth like balls, toss them into baskets or boxes, or toss them through hoops. SCIENCE: Plastic eggs are great for science explorations! Here are a few ideas. Matching Sounds: Place matching objects inside pairs of eggs. Close the eggs and secure with wide tape. The children can shake them and try to find theones that make the same sound. 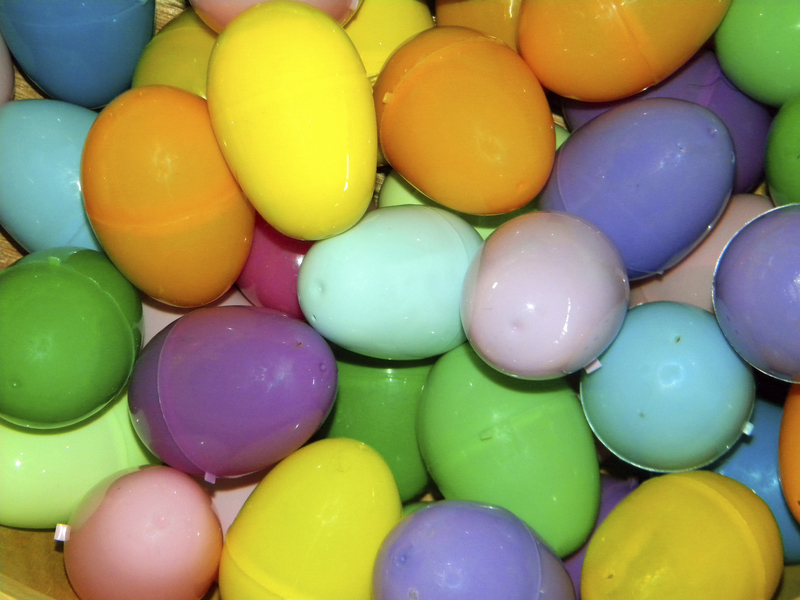 Flotation: Add different sizes of plastic eggs to the water table. Children can place different amounts of water inside the eggs, close them, and compare how they float. Wobbling Eggs: The children can press clay into one or both ends of the eggs. Encourage them to experiment to try to make the eggs stand and wobble. They can also compare how the eggs roll depending on how much clay is inside and how it is placed. Transparency: Some plastic eggs are transparent and others are not. Invite children to compare these. For added fun, shine a flashlight through both types or place them on a light table. MATH: Plastic eggs are particularly handy for math activities. Matching: Use markers to make sets of dots on each end. Separate the halves and invite children to match the halves with the same number of dots. You can vary this by having children match dots to numerals, or numerals to numerals. You can also place stickers on the egg halves or draw shapes to match. Seriation: Children may enjoy ordering eggs by size. Some can be nested. Patterns: Create simple patterns for children to copy with the eggs. They can also make their own patterns. Ask them to look at the patterns their friends make and try to guess the patterning rule. Comparing Weights: The children may fill the eggs with different amounts of sand or gravel and compare them on a balance scale to see which are heavier than others. Estimation: Children can estimate how many eggs will fit in a container and then test their ideas. FINE MOTOR SKILLS: Just snapping plastic egg halves together and pulling them apart builds fine motor skills. But they can be used in other ways too. Exploring Circles: Egg halves are also great for cutting circles from playdough or making circle prints on paper. Children may hold an egg half against a sheet of paper and trace around it with a crayon or marker. Transferring Materials: Egg halves can be used for scooping and pouring water or sand. Stacking: The halves may be stacked on each other. They can also be stacked on the sections of upside-down egg cartons. Digging: Hide eggs under sand in your sand table or a large tub of sand. The children can dig for them with their hands, spoons, or small shovels. You can also hide them under other sensory materials, such as gravel, birdseed, or shredded paper. LANGUAGE AND LITERACY: Try some of these fun activities. Alphabet Games: Write capital letters on one end of each egg and lowercase on the other end.Separate the eggs, and then invite the children to match them. You can also make small picture cards of words that begin with particular letters. Invite children to place each picture inside an egg labeled with the first letter. Storytelling: Begin telling a story. At a critical point, toss an egg to a child. The child continues the story and tells what happens next. The child can then toss the egg to another child who continues the story. Continue to give everyone a turn. Guessing Games: Hide some eggs around the room. Encourage the children to ask yes/no questions to figure out where the eggs are hiding. For another way to play, hide a small object inside a jumbo egg. The children can ask questions to try to guess what is in the egg. MUSIC: You can even make music with plastic eggs! 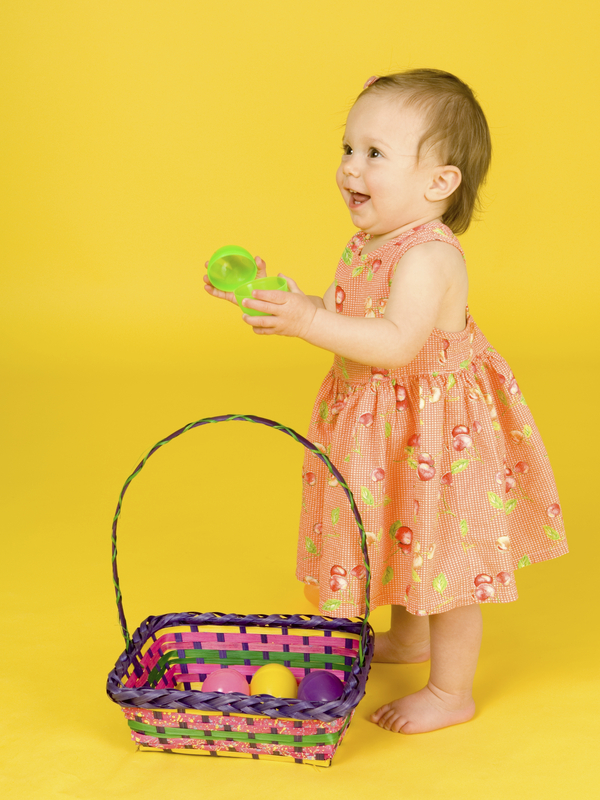 Tapping: Children can gently tap eggs together to the beat as they listen to music or sing. Shakers: Fill eggs with rice, aquarium gravel, or sand. Glue the halves together and secure with tape. The children can shake them as they dance to music.